She moved to India over a decade ago, and has since managed a guest house in Kerala, worked on the set of a Bollywood movie near Manali, and dined with the royal family in Udaipur. A native Australian, Sharell first visited India in 2000, and found it to be a complete assault on her senses — confronting but strangely uplifting and exhilarating. This hasn't changed, only now Sharell lives in cosmopolitan Mumbai where she writes full time and grapples with Hindi. Sharell arrived in Kolkata in late 2005 to do five weeks of community work during a break from her government accounting job in Melbourne, Australia. Despite returning to Australia a few of times, she never ended up staying there for very long. Instead, she's traveled the length and breadth of India, exploring the diverse attractions that the country has to offer. Sharell has managed a guesthouse in the beach town of Varkala in Kerala, worked on the set of a Bollywood movie near Manali, driven an auto rickshaw from Chennai to Mumbai, ridden a yak in Spiti, and dined with the royal family of Udaipur at their palace. She's also survived getting bitten by a monkey in Rishikesh, a bout of malaria, and numerous encounters with the infamous Indian bureaucracy, with sanity kept (mostly!) intact. She fell so much in love with all things Indian that she even married an Indian guy. 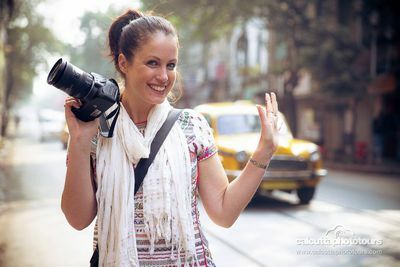 Sharell has been writing about India travel for TripSavvy since 2008. Sharell holds a Bachelor of Business from Monash University in Australia. Sharell is the author of the transformational memoir Henna for the Broken Hearted, which narrates her life-changing move to India. Sharell has given a TEDx talk on her life transformation.